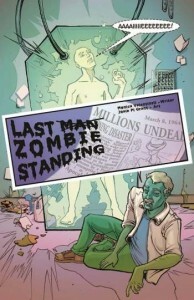 I am thrilled to announce the debut of my first comic Last Man Zombie Standing! This comic kicks off a series of single issues for UNFASHIONED CREATURES: A Frankestein Anthology published by Red Stylo Media. This is part of a digital rollout that’ll be in advance of the full anthology. The comic is available on the Red Stylo Media website and DriveThruComics.com. Only $1.99! I hope you enjoy my first comic. There’s a lot of Easter Eggs in this for anybody who likes 1960s pulp. It was a blast to write and I’d love to write more of these! If you recall, we announced the pre-order for this convention rulebook back in April. Today, I am pleased to announce that we delivered Gaming in the ‘Verse: GenCon 2013 Exclusive, as promised, on Thursday, August 15th. This preview for the Firefly RPG line, both the corebook and Echoes of War, are now available at DriveThruRPG.com. By now you should have a good idea what this rulebook is for, so let me address some questions we’ve received to help you understand more general information about the line I’m managing and designing. 1) What is the difference between the Serenity RPG and the Firefly RPG? 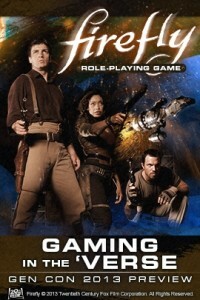 The Serenity RPG debuted in 2005 and employed a rule system which is now known as “Cortex Classic.” Based on the movie, this game was licensed through Universal Studios. The Firefly RPG, which debuted in 2013, employs the Cortex Plus engine which has been the foundation for Leverage, Smallville, and Marvel. The game is based on the Fox television series. This is not a new edition of the Serenity RPG; these are two, separate games and play very differently. This also means there are setting-related decisions we made to create a strong foundation at the beginning of the Crew’s story arc. As we show in the Exclusive, we’ll first reinforce the television series by providing all rules for secondary characters and dive into actual play examples for every Episode. We will start faithful to the show and will slowly expand into new canon — which we’ve already done by providing new ‘Verse-related locations, characters, ships, etc. 2) Shouldn’t River be more powered than she is? Why is Book presented as secretive? Wait… Where’s Miranda? We provided rules for the main cast at the very beginning of their story arc. River is still extremely mysterious — no one knew she had combat-related powers until Kaylee witnessed her fighting skills at Niska’s skyplex in “War Stories,” which was the tenth episode in Firefly. Even then, Kaylee did not reveal her skills right away. This also means that we will not be diving into the origin of Reavers due to the boundaries of our licensing agreement. They will be the mysterious boogeymen who haunt the black in their modded ships. There are marked differences for many of the characters at the beginning of the show versus what we know about them in the movie. So, the reason why you’re seeing that distinction, is because we intentionally provided their character descriptions and rules to line up with the TV series. 3) Do I have to run the Episodes as they are presented? Our adventures were designed for folk who’ve never run Cortex Plus before and for GMs who prefer a ready-made scenario. The system is incredibly flexible and no two gaming groups are alike. For that reason, I would gauge your decisions (both as a player and as a GM) according to the needs of your table. I’m finding that larger groups (I ran this for a cast of nine Crewmembers) will focus on banter more than smaller teams who’ll emphasize setting. Our role as a publisher is to provide as much material as possible so all types of GMs and players will get what they want out of these new stories. The sample Assets, Complications, and results table are just that — samples to help guide you as your Crew travels through the ‘Verse. For example, if you were to run Wedding Planners “as is” you’d get two to three sessions of play out of the scenario. 4) Is this the same rule system you’ll use in the corebook? We are going to take the Basic Rules chapter and split that up between player and GM so we can expand on certain points. These rules are the basis for Echoes of War adventures, so if you like Wedding Planners or Shooting Fish — I think you’re really going to dig the new Episodes we have in the pipe by some fabulous writers. Just fabulous. 5) What’s next? When’s the corebook coming out? First up, we’re releasing the stand-alone editions of Wedding Planners, Serenity Crew, and Shooting Fish that debuted in the Exclusive on September 3rd. To be clear: this has much of the same content. (The Exclusive has more, which is related to the corebook.) We’re separating these out to match the publication schedule for the Echoes of War line, and to provide fans with different options. For example, we anticipated that fans who picked up the Wedding Planners Cortex Classic Set, may prefer not to buy the Exclusive and just try a stand-alone Episode. We will continue to release Episodes in digital ahead of the corebook and this is next in line. Now that that’s over with, my attention is on the corebook and the other, unannounced products we’ve got coming up. I’m really, really excited about this. If you have other questions, feel free to ask them here. We have already incorporated feedback into what we’re working on; though our time frame is short, we are listening. It’s tough because we have to balance comments with getting games out on time — and that’s something I am hyperfocused on. Thanks for your interest in this shiny, new game! It’s about two weeks until GenCon, where we’ll launch the Firefly RPG. The logistics of managing personnel, working on the corebook, discussing system elements like Assets and Complications — on top of planning a convention — has slowed my writing to about 25,000 words these past few weeks. The majority of that was game-related. Now, I needed that downtime because Gaming in the ‘Verse: GenCon 2013 Exclusive (all 272 pages of it) was developed and polished in a few months. We all put ourselves through the ringer for this book and it has turned out beyootifully. Yes, it *is* finished. Laid out, approved by Fox, in PDF/print formats and is now in Indianapolis. (My other GenCon plans, to set up panels and the like for Onyx Path and for my portion of the Writer’s Symposium, were completed months ago. Last year, I was pushing the deal forward for John’s new game ROFL! from Cryptozoic. That game is debuting this year at GenCon, too.) And this week the heavy lifting on the Firefly RPG corebook began as well — and that’s just games! All this productivity, all this writing, does not remove one of the most important components in game design — playtesting. With everything that was going on, I got stuck when I was working on my Echoes of War adventure, “Friends in Low Places.” My story takes place in a town called Serenity View on the planet Hera. Now, the Cortex Plus system offers a lot of flexibility to take the adventure in a direction you prefer. At the same time, the five-act adventure structure offers crucial beats for the plot. Where did the tissues between Acts rip apart? How did Timed Actions affect the tension? The basic structure (e.g. the beats) and the characterization was solid, with the exception of the third act, which I ended up changing to better facilitate the development of the mystery. The connective tissues, however, were the weakest part. I needed to add in setting that allowed the players to explore Serenity View and find more clues. And added I did! In addition to the cast of five characters who shape this adventure, there are fourteen smaller locations and twenty to thirty minor characters. This is the connective tissue, the ability for players to interact with the story on a deeper level by exploring this new part of the ‘Verse. This is where the game takes place and, though some may call it “fluff,” I’ve always felt that having a fully-fleshed out environment is part of the game experience. If I didn’t provide that here, then the GM would have to create that, so I did. Now, I don’t assume that every GM will use all aspects of the town. My role is to provide more than enough ideas for two or three sessions of play, knowing that most GMs will tweak the adventure to their liking. Anyway, this is part of the reason why I feel playtesting is so important. The adventure and rules could be solid, or the setting could be there, or a rule could be inappropriate — but on paper you may not realize where your errors are until you play through it. Oh… And Timed Actions? *Great*!!!! Game Last Played: *coughs* Candy Crush. Still. Crap times two! It’s no secret I am a Doctor Who fan. Additionally, I am also a writer and have worked on IPs like, most recently, Firefly. My job, when I’m working on these properties, is to tell stories and create games for fans and in the best interests of the publishers who hired me. It’s also part of my job to be analytical about settings and characters to find cohesion and understand how the pieces fit. So, naturally I do this for anything else I enjoy — like Doctor Who. Yes, they have changed the gender of superheroes, multiple times over in fact. Sometimes it’s a woman assuming the mantle, sometimes it’s an alternate universe, and other times it’s a commentary on gender-swapping as a whole. Link, link, link, link, link. Why? Because it serves as a vehicle for great storytelling that’s reflective of the modern age. Those tales come from writers and artists, true, but comics does not shy away from cultural commentary nor has it avoided experimenting with new and controversial ideas in this art form. You don’t have to look very long or hard to notice how comic books have evolved through the decades. Even iconic, decades-old heroes, like Superman, have changed over the years. Superman from the 50s is not the same hero we know today. The Time Lords’ ability to change species during regeneration is referred to in the television movie by the Eighth Doctor in relation to the Master. This is supported by the implication by the Daleks that the First Doctor’s apparently human appearance was not his true form (The Daleks’ Master Plan, 1965) and the Fourth Doctor’s Time Lady companion Romana’s regeneration scene in Destiny of the Daleks (1979). In that scene Romana demonstrates an apparent ability to “try on” different bodies from a number of different species during her regeneration, before settling on a final, humanoid form which physically resembles Princess Astra of Atrios (see discussion below). This link from the Tardis Wiki has additional information with even more reference points. I, for one, would love to see a female Doctor because it’s a chance for more great storytelling. I get it. Change is hard. How many people didn’t like Amy Pond when she first appeared, but then warmed to her as her story was told? Having a new form is an opportunity to reinforce who (and what) the Doctor is. Why? Because changing what the Doctor looks like won’t alter who “he” is or what affects “his” character has on those around “him” — and that has the potential for amazing narration. For me, this isn’t politics. This is a way to tell new stories in the Who-verse that fit the canon. Caffeinated Beverages Consumed: Not buzzing yet! Work-Out Minutes Logged Yesterday: Laundry. Doesn’t that count? Game Last Played: *coughs* Candy Crush. DAMMIT. Latest Artistic Project: *Still* *still* *still* need to take pictures… It’s on the list! BUT? Edgar is coming back to life! Huzzah!